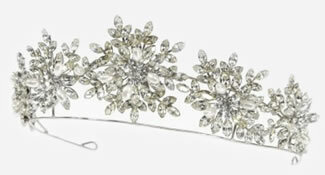 This page shows just the tiaras & hair accessories. For other jewellery in the collection, see the Couture Jewellery section. The designer has a reputation for unsurpassed craftsmanship and creativity – a leader of world class distinction. The unique styling allows the wearer to be reminded of classic elegance of a time gone by. Each design reflects originality and beauty, with each hand made piece ensured to become a treasured possession.